After initial spacecraft stabilization, the spacecraft and instruments underwent extensive commissioning activities to ensure proper operation. Final Mass, Power, & Data Rates for SOFIE, CIPS, CDE, BUS, and their totals. 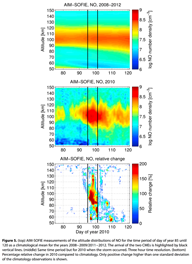 The Aeronomy of Ice in the Mesosphere (AIM) satellite mission is exploring Polar Mesospheric Clouds (PMCs), also called noctilucent clouds, to find out why they form and why they are changing. The AIM mission was launced in 2007 and has been extended by NASA through the end of FY15. During this time the instruments monitor noctilucent clouds to better understand their variability and possible connection to climate change. 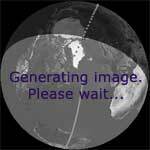 Individual instrument data collection status, as well as spacecraft and instrument health, will be monitored throughout the life of the mission and reported periodically on this website. The primary goal of the AIM mission is to help scientists understand whether the clouds' ephemeral nature, and their variation over time, is related to Earth's changing climate - and to investigate why they form in the first place. By measuring the thermal, chemical and other properties of the environment in which the mysterious clouds form, the AIM mission will provide researchers with a foundation for the study of long-term variations in the mesosphere and its relationship to global climate change. 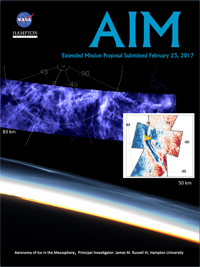 In addition to measuring environmental conditions, the AIM mission will collect data on cloud abundance, how the clouds are distributed, and the size of particles within them. Glowing silver-blue clouds that sometimes light up summer night skies at high latitudes, after sunset and before sunrise, are called noctilucent clouds. Also known as night shining clouds, they form in the highest reaches of the atmosphere – the mesosphere – as much as 50 miles (80 km) above the Earth’s surface. They’re seen during summer in polar regions. They’re typically seen between about 45° and 60° latitude, from May through August in the Northern Hemisphere or November through February in the Southern Hemisphere. 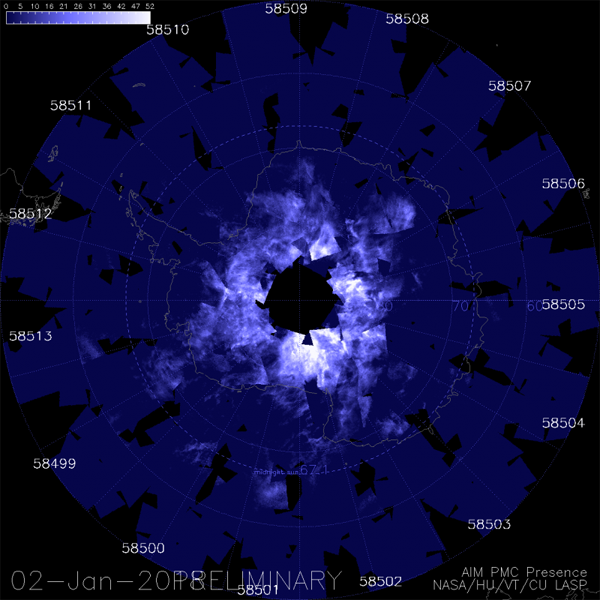 Click here for a video of noctilucent clouds over Antarctica in early 2014. Noctilucent clouds are thought to be made of ice crystals that form on fine dust particles from meteors. They can only form when temperatures are incredibly low and when there’s water available to form ice crystals. Why do these clouds – which require such cold temperatures – form in the summer? Observing tips: Look west 30 to 60 minutes after sunset when the Sun has dipped 6o to 16o below the horizon. If you see luminous blue-white tendrils spreading across the sky, you've probably spotted a noctilucent cloud. 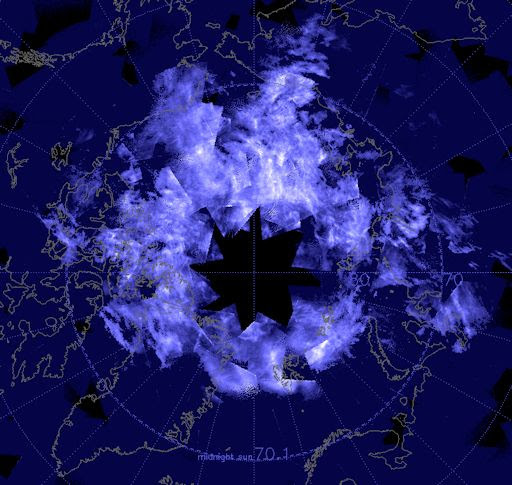 Although noctilucent clouds appear most often at arctic latitudes, they have been sighted in recent years as far south as Colorado, Utah and Virginia. NLCs are seasonal, appearing most often in late spring and summer. In the northern hemisphere, the best time to look would be between mid-May and the end of August. Why did last week's SpaceX launch look so strange? 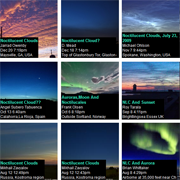 Space Weather News "Noctilucent Clouds from Space"
NASA's AIM spacecraft is back in business. Following a months-long interruption in normal operations, the polar-orbiting satellite is beaming back new images of noctilucent clouds at the edge of space. Data arriving now show a magnificent ring of electric-blue surrounding Earth's north pole, confirming recent sightings from the surface of our planet. Visit today's edition of Spaceweather.com to learn more about these strange clouds and the status of AIM. NLCs are, essentially, clouds of frosted meteor smoke. They form when wisps of summertime water vapor rise toward the top of Earth's atmosphere. Water molecules stick to the microscopic debris of disintegrated meteoroids, assembling themselves into tiny crystals of ice that glow beautifully in sunlight at the edge of space. Above: Noctilucent clouds surround Earth's north pole in this July 24th image from NASA's AIM spacecraft. 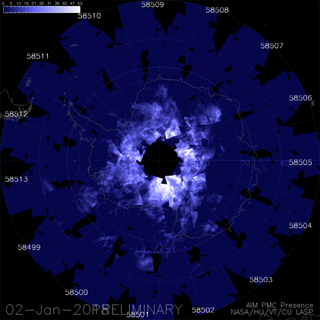 Data from NASA’s Aeronomy of Ice in the Mesosphere, or AIM, spacecraft shows the sky over Antarctica is glowing electric blue due to the start of noctilucent, or night-shining, cloud season in the Southern Hemisphere. This data was collected from Nov. 17-28, 2016.